Anti-government protesters take to the streets of Istanbul, triggering a plunge on Turkey's stock market. Stock markets in Turkey plunged Monday as investors took fright at escalating anti-government protests that began on Friday. The emerging market's benchmark index fell by as much as 8% in reaction to the unrest, triggered Friday by a small protest against a government plan to demolish a park in Istanbul, the country's commercial capital. The demonstrations have grown to become the biggest protest movement against Prime Minister Recep Tayyip Erdogan since he was elected more than 10 years ago. Turkish stock markets had been on an amazing run over the last few years, with the Istanbul Stock Exchange National 100 Index more than quadrupling in value since late 2008. Uncertainty in global markets over the past 10 days, combined with the angry protests, have knocked the Istanbul index back by 15% since closing at an all-time record high on May 22. A prolonged period of unrest could spell significant trouble for Turkey given its reliance on foreign capital and tourism. The eastern Mediterranean country made $23.1 billion from tourism last year. On Friday and Saturday, the bustling area in and around Taksim Square in central Istanbul became a battleground as riot police used water cannons, tear gas and armored personnel carriers to prevent protesters from entering the transit and commercial hub at the city's heart. 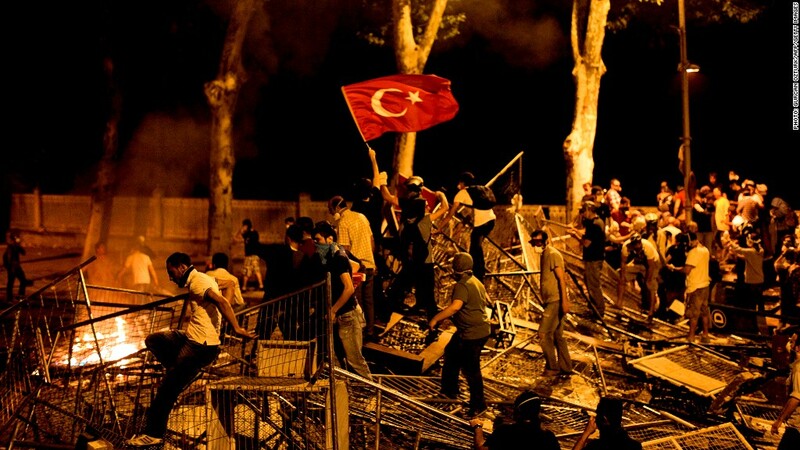 Other cities, including the capital Ankara and the Mediterranean port city of Izmir, have seen smaller clashes. The scope of the unrest show protesters are upset about bigger issues such as freedom of speech and accusations of an authoritarian government. In a televised speech on Sunday, Erdogan remained defiant. "I ask in the name of God, Tayyip Erdogan is a dictator? If you are the kind of person who can call someone who serves their people a dictator, then I have no words for you," Erdogan said. The Turkish equity market was a standout performer in 2012, with the benchmark index rallying by nearly 40%. Foreign investors have been lured by the country's favorable macroeconomic trends, including a young, skilled workforce and a strategic position between Europe and the Middle East. In 2010 and 2011, the economy grew by around 9% per year. The International Monetary Fund sounded a warning bell in late 2012, saying the country faced financing risks due to its dependence on foreign capital. It said Turkey should work to fix its low savings rate to avoid "boom-bust" cycles in investment and output. Growth slowed to 2.2% in 2012, partly due to government measures to prevent overheating in certain areas of the economy. The OECD forecast last month that gross domestic product growth would move back above 3% in 2013 and expand by more than 4.5% in 2014. -- CNN's Ivan Watson and Gul Tuysuz contributed to this report.